Channeling the powers I gained in wood shop class in 1993 in 7th grade, I made a magazine rack. 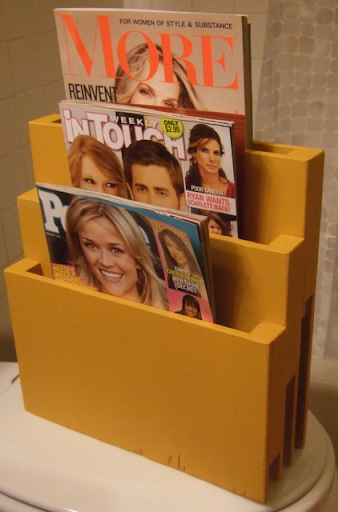 This was made of thirteen simple pieces of wood, glued together and painted, and yet this fills a need in my life which I tried to fill for a long, long time using the normal channels of, you know, buying a magazine rack. Yet, the magazine racks I could find in the store, or at garage sales, were always gigantic, possibly in case the owner needed to store between five hundred and a thousand magazines. I rarely have one thousand magazines at a time; typically I have about three or five. I wanted a small, upright rack which could tuck into a corner of the bathroom to hold just a few months' issues worth of a few subscriptions. Cut all the pieces of wood. Place one C-clamp on each side. Tighten the clamps as tight as possible without indenting the wood. My wood glue dried quickly, in about a half hour. Construct the next sandwich by placing two more side-lengths, one more bottom-length, and the third board together with glue. NOTE: It is important to build this thing front-to-back, not back-to-front, because of the placement of the C-clamps. The clamps need to be placed somewhere close to the side-lengths and bottom-length, and that does not work if it is constructed back-to-front. Sandwich on the remaining board and lengths. Allow to dry well before sanding it completely with a random-orbit sander. Sand the two sides so that they are smooth, any excess dry glue is sanded away, and the boards are flush with the lengths. Also sand the bottom so it is flat and sits well on the ground. This wonderful photograph shows how I painted it orange, which was a creative decision made because I already had orange paint. Luckily, orange is part of the color theme in our bathroom. Please note that the magazines here are shown for illustration purposes only. Neither I nor anybody in my household -- especially my wife -- would ever read such trash as the magazines shown. I have a copy of Marie Claire for you, er, uh, I mean, your wife. Courtesy of my wife.